Inuit textile art has its roots firmly in traditional culture. The patience and skill in making skin clothing, combined with the inherent aesthetic found in the intricate patterning of light and dark skin inlay, translated easily into the creation of contemporary expression using different media. This is particularly true in the Kivalliq region of Nunavut, located on the west side of Hudson’s Bay. 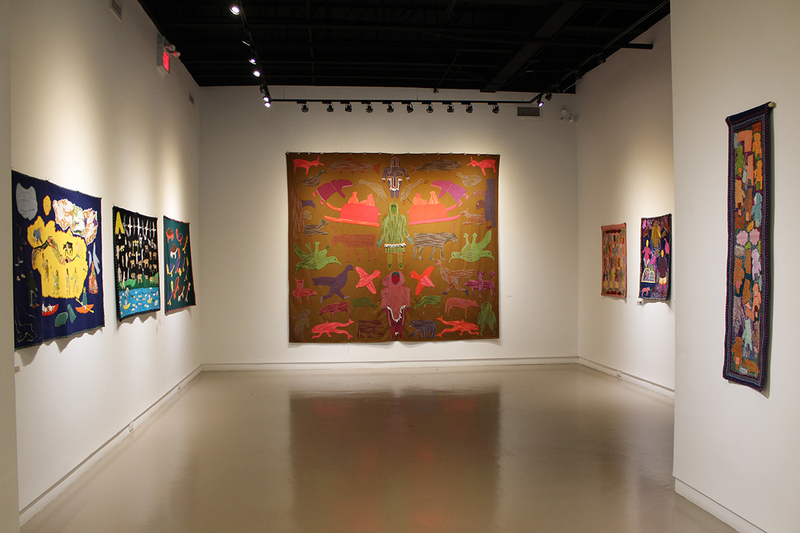 In the 1960s, the first generation of contemporary artists, notably Jessie Oonark, were encouraged to apply their graphic talent to the creation of wall-hangings made from duffel with applied felt and embroidery floss. The government supported this initiative initially but, over the years, this support became sporadic. In 1986, curator Marie Bouchard and her husband Jim McLeod moved to Baker Lake at a time when the artists lacked both materials and assistance. Over the next decade, they provided encouragement, supplies, financial support and marketing assistance, resulting in a spectacular renaissance of this exquisite form of artistic expression. The hallmark of these works of art is the combination of technical expertise and imagery, both of which are very personal to each artist. Some, like Elizabeth Angrnaqquaq, use the felt appliqué as a base for the narrative but then cover the entire surface with elaborate stitching. Irene Avaalaaqiaq, in order to create her mythical world of fantastic bird creatures, relies more on the patterning of the felt appliqué and uses less embroidery. Artists such as Mary Kuutsiq, Naomi Ityi and Mary Yuusipik Singaqti use a combination of both, varying the amount of embroidered stitching. Because of the nature of their materials, wall-hanging artists have greater opportunities for enhancing their imagery. They choose the shape and scale of the work when they cut the duffel. This can range from small to large, vertical versus horizontal presentation, or the can even creating a distinctive shape such as the stretched seal skin contour of the duffel ground for Woman with Fish by Veronica Manilak. They can vary the texture by changing the density of the embroidery; the densely embroidered parka of the standing man in People and Tools of Old Days by Nancy Sevoga Kangeryuaq is strikingly three-dimensional against the flat background of the duffel. In nearby communities, such as Arviat, artists incorporated traditional materials such as animal skin and caribou antler into their works. This can be seen in the exquisite combination of duffel, skin, antler and beads used to create Beaded Dancers by Joy Hallauk. In the nineteenth century, glass beads obtained from traders had been used to decorate traditional clothing. The magnificent Ceremonial Amautiq created in 2006 by Salome Kalaserk from Rankin Inlet is a contemporary version of these traditional women’s parkas; the small animal teeth alternated with beads recall traditional materials. Many of the artists in this exhibition have passed away but there is a younger generation who are still making wall hangings with the skills taught to them by their elders. As Janet Ajout Nungnik learned from an earlier generation, Gloria Inugaq Putumiraqtuq learned from Winnie Tatya; her signature mixture of even stitching and interest in creating images of traditional life on the land echo the style of her mentor. We are delighted to be able to provide the opportunity for a new generation of collectors to own these beautiful and significant works of art.